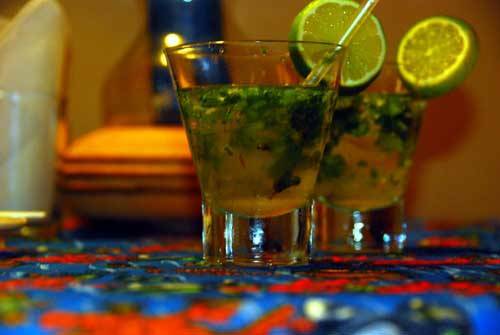 Hotel Restaurant Maya Luna is a small, friendly hotel-restaurant that combines a quiet atmosphere with an excellent personal service. 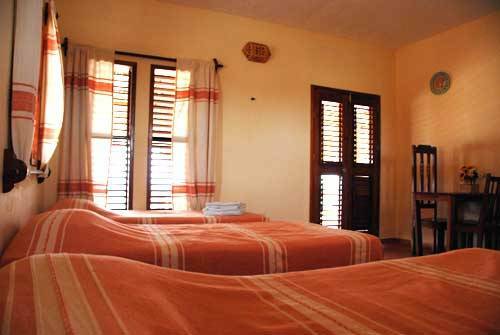 Hotel Maya Luna is the place to go when you want to be away from the madness of daily life. Here you can relax, read and reflect in a charming and natural environment. 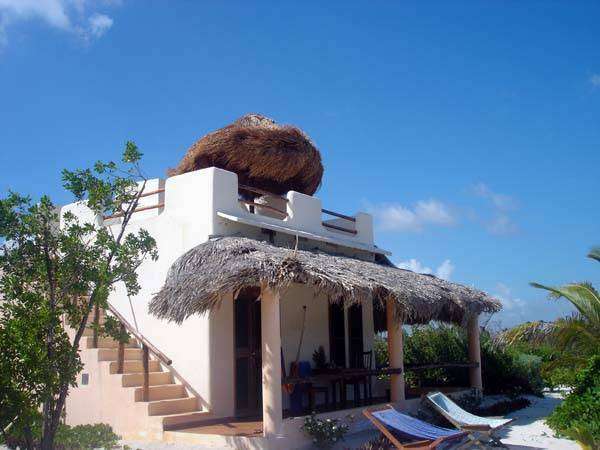 All beach front bungalows have their own private roof terrace, ideal for sunbathing or moon worshipping. Our restaurant is open for breakfast, lunch and dinner. Our menu offers a selection of European & Mexican dishes, most of them with an indonesian "touch". One of our specials is a stuffed pineapple with shrimps, cashew nuts, rice, chile poblano & omelette, topped with coriander. From local fisherman we buy all kind of fish, serve it fried or cut it into fillets, prepared with either a garlic, honey or mushroom sauce. Our bar offers coffees, fresh juices , beers, wines, tequila, cocktails and specials. 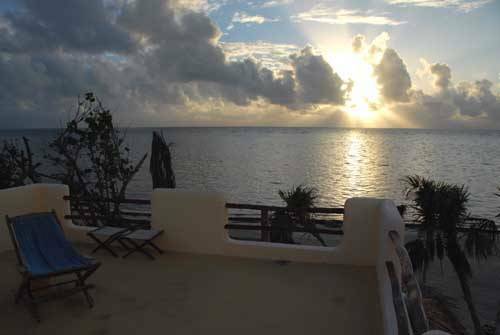 Maya Luna offers excellent opportunities for diving, snorkelling, flyfishing, deep sea fishing and watching exotic bird life. You can also walk or horse ride into the adjacent natural reserve of mangrove woods to explore recently discovered temples of the ancient Maya culture. We have an in-house dive shop, La Tortuga Azul. When you going diving or snorkeling, the boat leaves in front of your bungalow and takes you to one of the beautiful spots in front of the coast. The spacious, beachfront studios have private shower and toilet, fresh drinking water, king-size bed, hammocks and a seaside terrace. 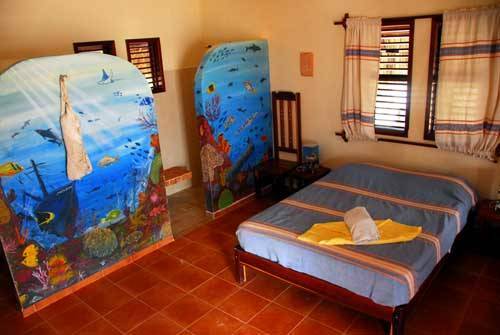 Fans will freshen up the rooms on the really hot days when the normally cool sea breeze is not enough. Each studio has its own private roof terrace, a perfect place to enjoy sunset, bright stars and full moon. For Mexican people: Deposit money on our Mexican bank account. For all other nationalities: Pay with your credit card via internet by Paypal. The deposit amount is refundable up to 1 month before your scheduled arrival date, after which time the entire deposit is nonrefundable. If during your stay, you find it necessary to depart early, we require at least a three night's notice. You will receive a refund of 50 %. From Cancun airport drive south, direction of Chetumal on highway 307. 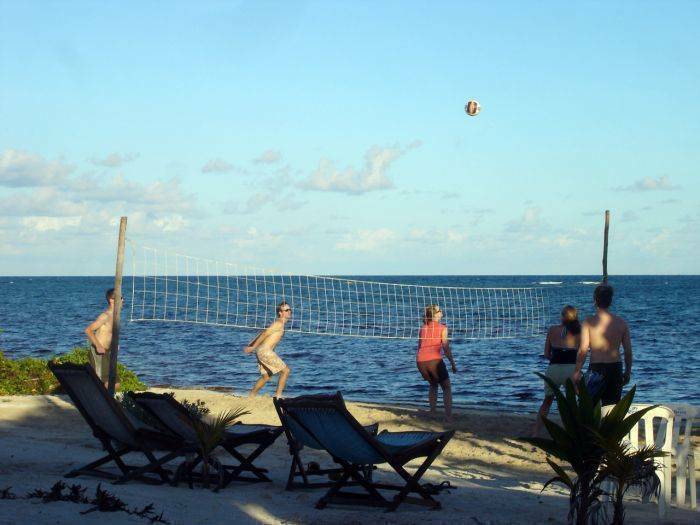 You will pass through the towns of Playa del Carmen, Tulum and Felipe Carrillo Puerto. After 290 kilometers, you pass through Limones, a small village. Continue a few kilometers, until you see the road signs indicating to turn left to go to Mahahual. Continue for a half hour drive on a very good road through the mangrove swamps. After 50 kilometers there is a junction where you can turn to the right. DON’T do that, his is the road to Xcalak. Just continue 5 more kilometers. Arriving at the Caribbean sea, turn to the right (you have no other option ) and pass nehind the little fisherman’s town of Mahahual. After 5 km more you pass a little bridge over the “Bermejo river”. Approaching the curve just after the bridge you can already see Hotel Maya Luna. Take the Mayab bus to Limones (approx. 3. 5 - 4 hours). There, take the Carribe bus to Mahahual (approx. 1. 5 hours). The bus stops just in front of our hotel (ask the driver to stop there). Or take a cab from Limones to Mahahual (250 pesos).